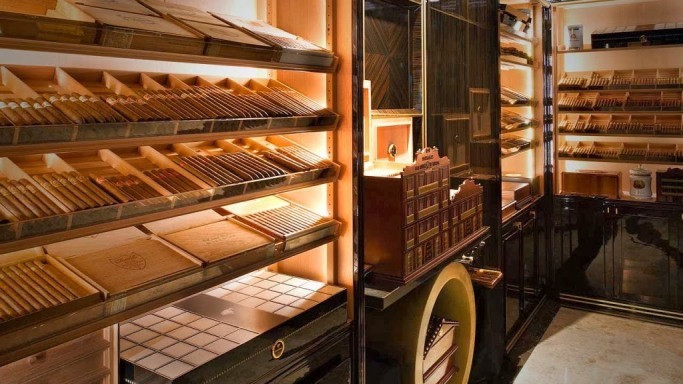 Have you ever been curious as to how much the most expensive cigars would cost you? Just ask anyone who smokes cigars on a regular basis, this is a very expensive hobby to say the least. Walking into a cigar shop for the fist time, and you might have sticker shock when you see $2 and $37 prices for individual hand rolled cigars. Cigars range from good, great, and premium, each costing significantly more money to move up in taste and flavor. Here is a list of the top 10 most expensive cigars that range from great to premium. Available in three different sizes, the Stradavarius Churchill is the most costly of the three and will set you back $34 per cigar. What makes this cigar so unique is the unique blending of Mexican, Dominican, and Nicaraguan tobacco rolled into the habano wrapper leaf. This cigar might land in the number 10 spot, but definitely does not diminish the quality of this cigar. What makes the Cohiba brand so unique, it was founded back in the mid 1960’s in Havana, Cuba, yet it is still in production today as popular as ever. The Cohiba Esplendido can be purchased for $750 a box or approximately $35 per cigar. Even at these prices, this cigar provides a full robust flavor that many cigar smokers rank in their top three cigars. When Jose Orlando Padron founded this cigar company, had no idea he would be around at 80 years old to celebrate. The Padrón Serie 1926 80 Years cigar was made specifically to celebrate his 80th birthday, and instantly became a hit with cigar smokers. This particular blend is the cheapest premium cigar the maker has produced. At $40 a cigar, they are available in both natural and maduro wrappers. The Louixs has been touted as the finest cigar produced that money can buy. This cigar manufacturer, Goldwin Metropolitan Company, produced the cigar in a sixty by six inch ring gauge for the Beverly Hills Cigar club and sell for $50 a cigar. Sold individually only, they come in the rosado wrappers. Like the name BBMF implies, this truly is one big bad mother of a cigar. Extremely rare to find, the Arturo Fuente Opus X BBMF will cost you $56 per cigar. This particular cigar really does have a serious punch, something a true cigar lover will appreciate after one hit. If you are looking for a long cigar, rounding out the top 5 of the top 10 most expensive cigars is the Arturo Fuente Opus X-A. It measures in at an impressive nine and a half inches long. Considered one of the rarest cigars in the world, select cigar shops still have them available at $80 per cigar. The president of Fuente created the Don Arturo AnniverXario as a tribute to his dad back in 2001, but it was not released for sale until 2008. A chest of these cigars will set you back $7,500, or you can grab a single cigar for $85 at select cigar shops. Now we move into the premium blends, and the Cohiba Behike is definitely one of those blends that drew a ton of attention. Originally released at $450 a cigar, the manufacturer has since re-released the brand as a unique blend for only $50 each. This cigar has been infused with some Louis XII Cognac, and will set you back $750 a cigar. The manufacturer only produces 100 boxes each year. A box of 20 of the Gurkha His Majesty’s Reserve will only cost you $15,000. Our most expensive cigar on the top 10 most expensive cigars list is the Gurkha Black Dragon. Costing cigar lovers $1,150 a cigar, only a handful of chests are created each year. This cigar measures in at an impressive 8 1/2 by 52, a chest of 100 cigars will cost you $115,000.